A still shot from Gods in Shackles documentary produced and directed by Sangita Iyer. 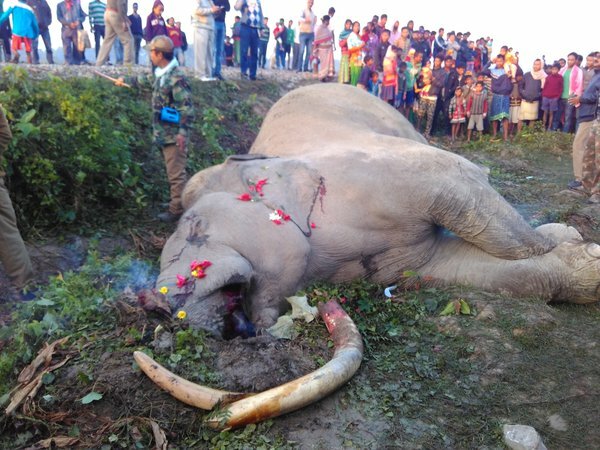 In recent days, human-elephant conflicts have been escalating, making sensational headlines across India. 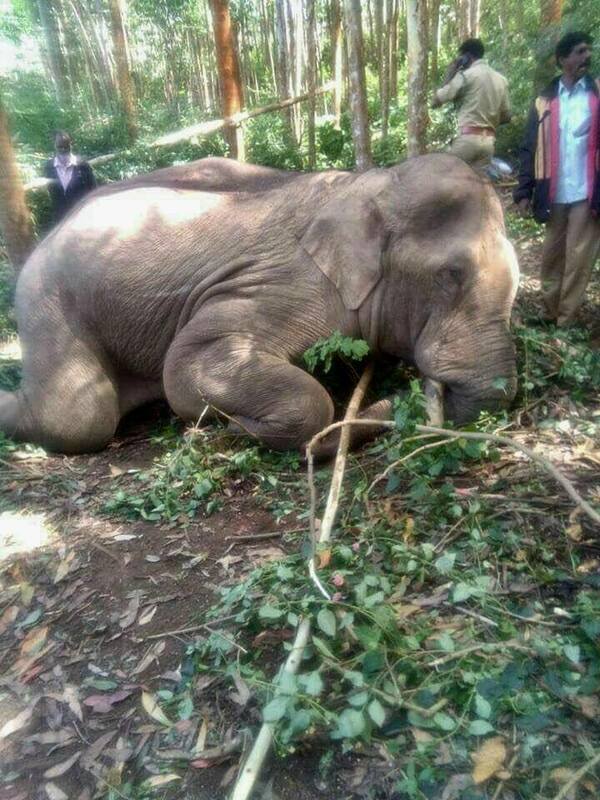 One of the recent deaths of a harmless wild tusker, affectionately called "Chilli Komban," sparked outrage among wildlife activists, with the Kerala government laying criminal charges against those who rammed him to death with an excavator. The underlying issue is the significant growth in human population, which reached a milestone as of August. It now stands at 7.5 billion, of which 1.34 billion humans are in India, spitting out babies literally by the second, as tracked by Worldometers. Driven by the ever-expanding human population, the Asian elephants are faced with pre-eminent threats including habitat loss, degradation, and fragmentation. Development projects, agricultural plantations, construction of dams, roads, and railway lines continue to fragment the elephant habitats, disrupting their migratory routes. According to a report by the government of India, 40 elephants have been killed on railway tracks between 2014 and July 2017. Warning: the photo below may be upsetting. Another media report suggests that "The destruction of their natural habitat and the disruption of elephant corridor are said to be the reasons for the increased incidents of elephant intrusion into human habitations." Making matters worse is the fact that a substantial proportion of India's population lives near the fringes of the elephants' ranges, splitting up elephant herds into small and isolated pockets and threatening their long-term survival. In the second most densely populated country in the world, a huge percentage of the elephants' former range has been lost, and the remaining habitat is shrinking rapidly. And as the human population multiplies in these areas, the elephant habitats are being transformed into farmland, luring elephants to the crops that the farmers rely on for their livelihoods, further intensifying human-elephant confrontations. In extreme cases of conflicts, elephants have been caught and taken to the so-called Elephant Training Centers where they languish, lost to the wildlife population. According to the World Wildlife Fund, these confrontations are the leading cause of elephant deaths in Asia. 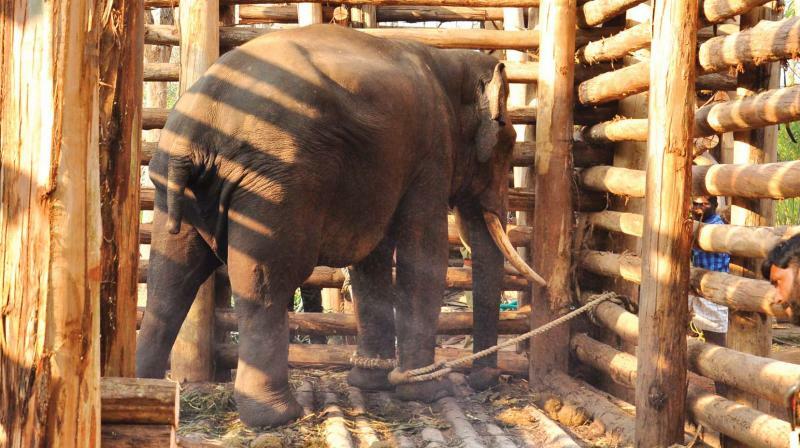 The pathetic plight of Kallur Komban, a wild tusker who was captured from the forests of Wynad in Kerala for "raiding crops" epitomizes the conundrum, as his condition briskly deteriorates. Kallur Komban remains in this tiny enclosure since his capture in November 2016. The forest authorities are currently mulling over the capture of two "rogue tuskers" and "marauding jumbos" who are "menacing" the local residents near Munnar district. These instances are a stark reminder that proactive and strategic measures need to be taken immediately in curbing human-elephant conflicts. The harsh reality is elephants are one of the first species to suffer the consequences of habitat fragmentation, development, and agriculture. Being the largest living land mammal, they require larger areas to roam, as well as more food and water than most other mammals. This makes it difficult to coexist with people in areas where agriculture is the dominant form of land use. The International Union for Conservation of Nature (IUCN) puts it succinctly: "The long-term future of elephants outside protected areas, as well as in some protected areas, is therefore inextricably linked to mitigating such human–elephant conflicts, and this is one of the largest conservation challenges in Asia today." Even in the early part of the twentieth century, more than 100,000 Asian elephants thrived across Asia, however, in the last three generations, their numbers have declined by at least 50 per cent, as they continue to vanish at an unprecedented rate. Today there are approximately 40,000-50,000 Asian elephants, with at least 30,000 of them thriving in the Indian jungles as of 2012, making it imperative for the government of India to protect this global treasure. The Nilgiri biosphere reserve, a 5,000-square-kilometre paradise stretching across three states in southern India, boasts more than half of the Indian elephant population at 16,265, with the northern Indian state of Assam housing 5,620 elephants as of 2012. These states are particularly vulnerable to human-elephant conflicts. A still shot from the Gods in Shackles documentary. Meantime, as we celebrate the World Elephant Day, there are reasons to be optimistic. The highest authority of India, the Supreme Court, has stepped up to the plate to curb human-elephant conflict, ordering the creation of "27 corridors across the country for safe passage of elephants and other endangered animals, and directed it to "positively" file a response within three months." In addition to creating corridors, the forest department of Kerala with the densest elephant population in the country is planning to plant fruit-bearing trees and dig water holes in core areas of the forest, as food and water shortage is pushing elephants out of the forest and luring them into human dwellings. "The Walayar forest range has already raised 5,000 saplings of jackfruit, mango, papaya and 'njaval' in two nurseries in association with the Velancheri forest protection committee under the 'Green India' project of the Union ministry of forest and environment," an article from The Times of India read.